O, what a splendid week to be down by the shore in Old Lyme, CT. Not only because Old Lyme is such a sweet small town but The Side Door Jazz Club 3 excellent shows for jazz fans. Thursday August 21, the Club welcomes back bassist/composer Ben Wolfe. A native of Baltimore, MD, Mr. Wolfe has performed with a slew of strong performers, from Harry Connick Jr to Wynton Marsalis to Diana Krall. He has also been the foundation for groups led by pianists Orrin Evans and Eric Reed. He's assembled a powerhouse Quartet, starting with the impressive drummer Donald Edwards plus young pianist Emmet Cohen and the fine saxophonist Stacy Dillard. Because the leader's interests are so varied, expect the music to go in many different directions but always with great forward motion (and, of course, the occasional ballad. To learn more about this fine musician, go to www.benwolfe.com. Doors open for every performance at 7:30 p.m. with the music set to start at 8:30. The following night (Friday 8/22), the Side Door welcomes the fine trumpeter Darren Barrett and his dB Quintet. Born in Canada to Jamaican parents, Barrett did his undergraduate work at the Berklee School in Boston and went to Queens College for his post-Grad years. He moved on to the Thelonious Monk Institute where he was a member of its first group of graduates - in fact, Mr. Barrett won the 1997 Monk International Jazz Competition. He's gone on to play with the Roy Hargrove Big Band, Herbie Hancock, Esperanza Spalding and many others. He's also issued 6 CDs as a leader, including 2 in 2014, "Energy in Motion: The Music of the Bee Gees" and "Live and Direct 2014" with his dB Band. The latter recording features the same lineup that will grace The Side Door stage and they are Takeshi Ohbayashi (piano), the brothers Alexander L.J (bass) and Anthony A. Toth (drums - see below) plus the excellent saxophonist (and frequent Side Door guest) Myron Walden. Judging by what I've heard of the CD, I'm sure this audience is going to really enjoy the energy and musicianship of this great young band. Check out Mr. Barrett at www.darrenbarrett.com. On Saturday August 23, vocalist, composer and arranger Kavita Shah makes her both her Side Door and Connecticut debut. Her sparkling debut CD, "Visions", came out earlier this year on Greg Osby's Inner Circle Music and it's a most impressive beginning (my review can be found here.) Co-produced with guitarist Lionel Loueke, the recording contains original material as well as smashing covers of pieces by Joni Mitchell, Antonio Carlos Jobim, M.I.A., Samir Chatterjee, and Stevie Wonder (who composed the song that gives the disc its name.) Ms. Shah, a native of Manhattan, also wrote lyrics to Wayne Shorter's "Deluge." She created the arrangements for the string quartet that appears on several tracks plus sang almost all of the backing vocals. Her voice is quite animated, full-toned and she has a wide range. She's bringing quite a band, ranging from the Argentinian-born Leo Genovese (piano), Venezuelean-native Bambam Rodriguez (bass), the utterly great drummer Clarence Penn, and the tabla player Stephen Cellucci (whose work on the CD is excellent). Considering the width and breadth of the material as well as the talent of all those on stage, this should be a special evening of music. Find out more by going to www.kavitashahmusic.com. For tickets and more information, go to thesidedoorjazz.com or call 860-434-0886. The afore-mentioned Toth brothers and pianist Takeshi Ohbayashi constitute the rhythm section for "Royal Flush", the self-released debut recording of clarinetist Felix Peikli. Peikli, born in Norway on April 2 1990, has been turning heads since his debut at the age of 12. After receiving the prestigious Capital of Norway Honors Prize in 2007 (the youngest ever to do so), Peikli received a full scholarship to the Berklee College of Music 5-week program. After his move to Boston, he began to work with numerous musicians, most notably as a member of drummer/composer Ralph Peterson Jr.'s Fo'Tet. Listening to his debut, one can hear traces of the brilliance and technique of the young Don Byron. Both can play in many styles, both have exquisite tone and both understand how to command a performance. On his recording, Peikli composed all the music save for the stunning solo reading of George Gershwin's "Summertime." Throughout the album, he utilizes his touring quintet which includes the Toths, Ohbayashi, and guitarist Michael Bono. Electric bassist Marcus Miller adds his elastic phrases to the funky yet melodic "Queen of Hearts", also filled out by the wordless vocals of Kim Wigaard Johansen (whose main gig is as an opera singer) and Sara Lade. Albino Jorge Mbie, from Mozambique, joins the vocalists on the opening track, "Wagadou Roots", which is one of the tracks that displays the influence of Ralph Peterson. One can hear that influence in the airiness of the melody line and in the propulsion of the rhythm section. The aptly-named "Heat" features the fine trumpet work of Lee Hogans whose Woody Shaw-like lines spring out of the speaker. Ohbayashi channels McCoy Tyner for his short solo while Peikli rides the sonic waves created by the rhythm section. Other highlights include the handsome ballad "Nocturnal"; everyone shows great restraint with both Peikli and the pianist playing melodic solos. "Intro to Royal Flush" opens with a lovely pano melody before Johansen and Bono present the main theme. After that sweet "Intro", the quintet plus flutist Sarpay Özçağatay (and the sound design of Eric Kwong) create quite a groove (a fine mashup of African and Afro-Cuban rhythms) on the title track. There's a hint of the Pat Metheny Group in how Peikli incorporates the vocals and Bono's acoustic guitar near the close of the piece. "Royal Flush" is an auspicious debut for a musician with an extremely bright future. 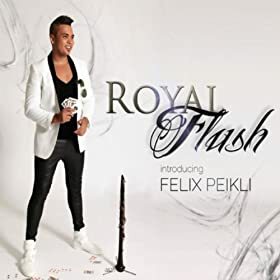 Felix Peikli and his band of 20-somethings give hope that the music they play, this fusion of their myriad influences born from the rhythms of the African continent and in the streets of New Orleans (and other great cities), will resonate for years to come. For more information, go to www.kingclarinet.com. Clarinetist Andy Biskin, born in San Antonio, Texas, played many styles of music as he grew up; in high school, he led a polka and waltz band. Biskin went on to study music and anthropology at Yale and to work with noted folklorist Alan Lomax. Over the course of 5 CDs (starting with 2001's "Dogmental"), he has blended his love for well-composed melodies with a wicked sense of humor. One can hear the folky strains of Jimmy Giuffre's music from the mid-1950s, rhythms from early New Orleans, funk from Memphis and Muscle Shoals, melodies from rural America, and concepts from contemporary classical music (with a soupçon of P.D.Q. Bach) - in other words, file under "eclectic." "Act Necessary", his 5th recording for Strudelmedia, introduces Biskin's new ensemble Ibid, a quartet comprised of the leader with Brian Drye (trombone), Jeff Davis (drums) and the ubiquitous Kirk Knuffke (cornet). The title track, with Davis's sly rhythms pushing the beat, comes in like an acoustic re-imagining of Herbie Hancock's "Rocket" (but nowhere near as robotic.) Beneath Knuffke's solo, Drye plays the bass line - throughout the program, one never misses a bass player. The "lightness of being" created by the melodies, by the blend of the reeds and brass, and, especially by the masterful playing of the drummer, helps the music to flow without the "anchor role" of a bassist. And, this is such conversational music. The call-and-response of gospel music is used to great effect on piece like the sprightly "Just Like Me" while Drye's "oom-pah" trombone bonds with the drums on "Balderdash" so Knuffke (who, at times, offer counterpoint "oom-pah") and Biskin can create snappy solos. Music-box chimes serve as an introduction to "Whirligig", opening to a sweet melody line above the "soft-shoe" drums. Drye's "way-wah" trombone solo alongside the cornet and clarinet gives way to Biskin's slippery interchange with Davis. Note the change in the drummer's attack in his dialogue with Knuffke - the music opens up, speeds up, setting the stage for Drye's melodic duo with Davis. By now, you realize that "anything goes." Yet, none of this music is forced. "Pretext" may remind some of Julius Hemphill's "The Hard Blues", funky, even greasy music, that clings closely to the "elemental" drum-work. Typical of many Biskin songs and arrangement, there is a hitch in the proceedings, in this instance, the little stops-and-starts before and after the solos (except for the clarinet spotlight that closes the piece.) "Annie's Day", the short piece at the end of the program, is neither filler nor throwaway but a smartly arranged piece for the quartet built upon an appealing melody. "Act Necessary" captures the ears and the mind from the opening notes, not letting go until the whirling melody of "Annie's Day" fades. Afterwards, this music resonates. One wants to return to each song to pay attention to how the clarinet and brass wraps itself around the drums, how Jeff Davis supports and pushes the music, and how the soloists make such succinct but satisfying statements. Andy Biskin may not be a prolific recording artist but he certainly creates captivating music each time out. To find out more, go to andybiskin.com. While there, take time to check out his "Goldberg's Variations."